Edu Manzano still considers Angel Locsin his ‘anak-anakan’ even after her breakup with son Luis Manzano. 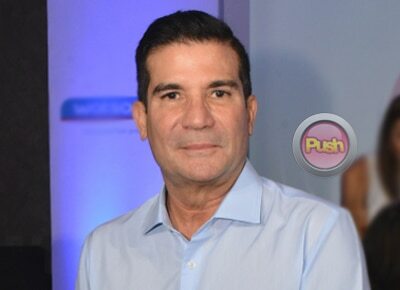 Now that his son Luis Manzano has been open about dating Jessy Mendiola, Edu Manzano revealed he has gotten to know the Kapamilya actress. “I see Jessy. We go out for occasions. Sometimes nag-di-dinner. Whatever makes my children happy. Yun siguro ang pinaka-importante. It’s not important what daddy wants. It’s what they want,” he shared during the Watsons Switch and Save presscon held in Makati city. Edu said that he tries to remain supportive and not meddle in his children’s personal affairs even if they sometimes get involved in controversy. “Hindi na ako nakikialam, kayang kaya na nila yun. Pinapatulan pa nga ni Luis di ba? (laughs) I mean they’re okay. I just wish social media was used for more positive things. Hindi lagi yung pagiging sa pag-ba-bash lang ng tao,” he admitted. Edu said he also does not want to pressure his 35-year-old son into marriage. “You know I never ask him and I will never do anything na maaring isipin na pini-pressure ko siya,” he added. Although he claimed he never had a favorite when it comes to his son Luis’s girlfriends, the Watsons celebrity endorser said that he still feels close to Angel Locsin even after her much-publicized breakup with his son last year. In fact, he still even affectionately calls her ‘anak.’ “Yes oo. May isang aspeto sa naging personalidad ni Angel na forever will remain etched in my mind, and this is how she takes care of her father. Her father, may kapansanan, but si Angel has always been there and I can feel it, parang nag-ba-bounce off yung feelings niya sa akin. Nararamdaman ko yun. I’m not saying I want my children to take care of me like that. But it’s always nice that children remember that they are still children, that they are products of somebody,” he shared. After his senatorial bid last year, Edu said he is not planning to run for politics again anytime soon. “No I’m in a very nice place right now. I will be a good citizen and I’ll do my part,” he explained. The 61-year-old actor also shared some advice for fellow actor-politician Cesar Montano who recently got into hot water after Tourism Promotion Board employees filed a complaint against him. “Well expect that. Expect your every move to be scrutinized. You know kami before kami in law enforcement before sa Optical Media Board nag-ingat talaga kami because actually being an artist ang mata ng tao nasa inyo eh. So I guess exercise of caution is in order,” he said.